“The winds of grace are always blowing. You must hoist your sails to catch them.” So said Swami Ramakrishna Paramahamsa (1836 ~ 1886). I was, yet again, reminded of this beautiful perspective on Life last evening. 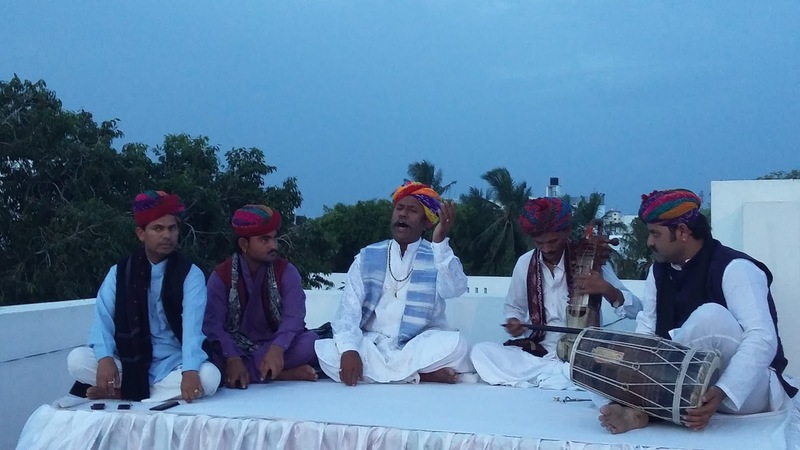 A friend and his family had organized a concert by the Manganiyars – a community of folk singers from Rajasthan – on their rooftop. It was an unusual evening in Chennai – it was still very warm, but as the sun set, dark clouds gathered and very strong gusts of wind blew over the city. It didn’t rain. But it came menacingly close to raining. In this backdrop of the game of hide and seek that nature played, five Manganiyars performed at their soulful best. There were no additional lights on stage, no mics and no speakers. The artistes just jammed – led by the supremely talented Ustad Anwar Khan Saab on the vocals and the world-renowned Mansoor Khan on the Dholak. The other three artists played the Kartaal and the Sindhi Sarangi between them. As Anwar Khan Saab sang he lost himself to his music. And held all of us in the audience in a trance. His deep voice, the rhythmic beats of the Kartaals, the sublime strains of the Sindhi Sarangi and the unobtrusive yet unputdownable presence of the Dholak made the evening truly magical. I picked up a few learnings. The first was humility. Anwar Khan Saab is one of the most feted Manganiyars. Yet, as he began the concert, he humbly looked at each of the other four artists in the troupe and asked them: “Izzazat ho, toh shuru karein…” Meaning: “May we have your permission to begin…” There’s an Urdu word called ‘tehzeeb’ which actually means ‘culture’ but combines the essence of being ‘humble and dignified in demeanor’. Khan Saab embodied that word ‘tehzeeb’ in the way he spoke, he sang and he conducted himself last evening – he personified humility. Second, I re-learnt the value of respecting a senior. Mansoor Khan is younger, is more relevant and hugely famous across the world. Yet Mansoor let Khan Saab lead the whole concert last evening and do all the singing. It’s the kind of difference in appeal that would exist in the cricketing world between Sachin Tendulkar and Sunil Gavaskar that is there between Mansoor and Khan Saab. Even so, Mansoor was content with just being the Dholak player yesterday – happy to share stage presence with the Ustad and sing for the joy of singing alongside the maestro. Third, I felt the grace – yet again – in my Life. Not that it is ever absent in any of our lives. It is always there. But we are so busy earning-a-living, running on our Life-treadmills, that we miss this grace. But I have realized that whenever I have let go, whenever I have just let a higher energy draw me in its direction, hold me in its sway and take me where it wants to, I have felt the grace. Last evening, I almost did not make it to this home concert of the Manganiyars. It had been a tiring Sunday at home. And all I wanted to do was have a drink and watch television. But our hosts are very, very special. And the Manganiyars are our favorites – particularly Mansoor Khan. So, despite my body protesting, I completely let go as Khan Saab began. For the next two hours it was a pure bliss and grace show! My wife Vaani concurs with me. How else do you explain such great weather in Chennai in the middle of June, such great artists jamming in front of you with no commercial trappings, such soulful music and us in the midst of all this – when we can never quite dream of buying tickets to a live performance of this class, given our fragile financial state? As the concert ended, I took a swig of Kingfisher beer that my host graciously offered. And then I looked up at the sky and smiled in gratitude and joy. I was reminded of what the Buddha has said: “When you realize how perfect your Life is, you will look up at the sky and laugh!” Indeed, I don’t think that we will ever have a perfect Life – the way we want it. It is always what it is. And if you can accept what is, you will have raised your sails, you will then have felt the grace in your Life, you too will then perhaps look up at the sky and laugh….! 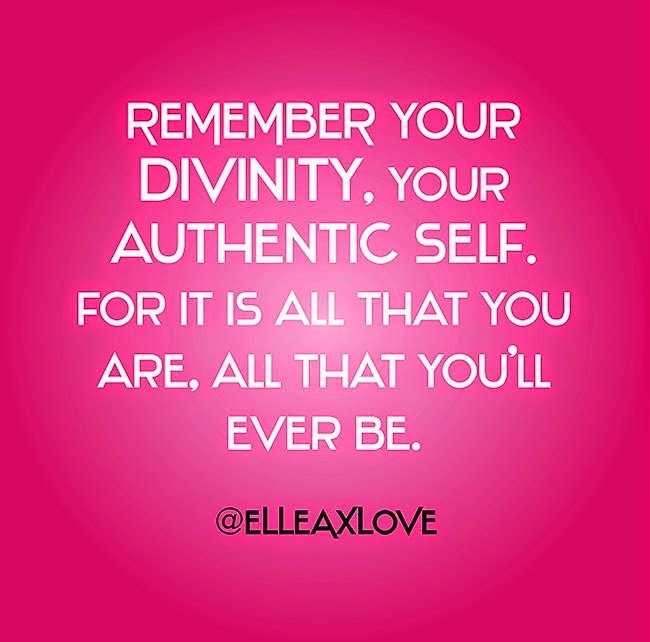 Let go and discover the divinity in you! There’s divinity in every aspect of creation – including in you. You don’t see it because of the way in which you have been conditioned to think of divinity. The way we think of garbage, sewage, filth is with a sense of distaste. Yet, there’s divinity there too. When you see fresh vegetables, you see it as beautiful, sublime, pristine. The same vegetables when they turn stale or are part of wasted food and end up in a garbage dump, you find them detestable. Similarly, when you see a sewer, you hate the sight. But there’s a sewage system in your body: your intestines and kidneys are doing just the same job__precisely. A hallmark of an evolved person is the ability to see everything and everyone as equally divine. Each moment in your Life has been waiting for you since you were born. The trajectory of your Life has been pre-cast and the problems you encounter too are the hurdles that are set up there to make you aware of your true power. To discover that power, your divinity within you, you must just let go. When you let go, you actually invite boundless grace into your Life. It may bring pain, the thought and the act of letting go, but eventually, it leads you to your divinity, to freedom, joy and bliss! Author AVIS ViswanathanPosted on January 23, 2015 March 14, 2016 Categories Art of Living, http://schemas.google.com/blogger/2008/kind#post, Inner Peace, Intelligent Living, Swami Ramakrishna Paramahamsa, ThayLeave a comment on Let go and discover the divinity in you! We often think we are powerless and our problems are all powerful. This is the paradox of Life. The truth is our problems are powerless in the face of the grace and blessings in our lives. Swami Ramakrishna Paramahamsa (1836~1886) said it so beautifully,”Hoist your sails, for the winds of grace are blowing.” Those winds are always blowing. Your Life__and mine__is always blessed. But in the throes of problems, in the epicentre of your personal maelstrom you forget to do the simplest thing, to hoist your sails__which is to open yourself up, to surrender and to let go. In the Danny Boyle film ‘127 Hours’ , Alan Ralston prepares to die of hunger, pain, thirst and hopelessness, when he makes a last attempt to save himself__he lets go, literally, of his lower right hand. That act of letting go in his case was both physically painful and metaphorically liberating. For us, the metaphor alone should suffice and hopefully be awakening. Each moment in your life has been waiting for you since you were born. The trajectory of your Life has been pre-cast and the problems you encounter too are the hurdles that are set up there to make you aware of your true power. To discover that power, you must just let go. When you let go, you actually invite boundless grace into your Life. 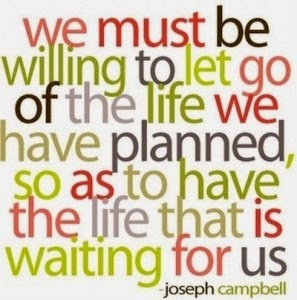 It may bring pain, the thought and the act of letting go, but eventually, it leads to freedom, joy and bliss! 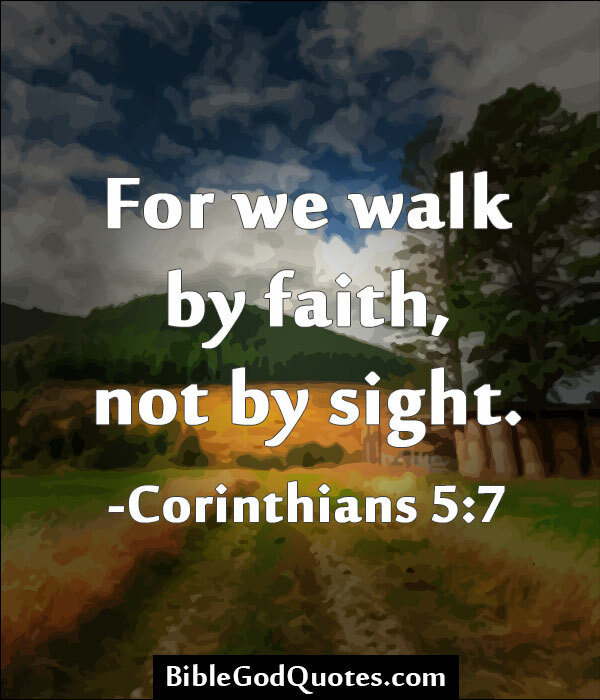 In Life’s most excruciatingly painful moments, keep the Faith – fundamentally in yourself. Know and believe that if you have been created (without your asking for it), you will be looked after and cared for. 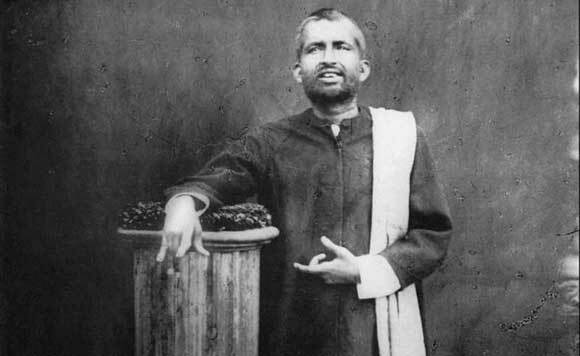 Today is Ramakrishna Paramahamsa’s death anniversary. He often used to tell the story of a milkmaid to awaken people to have faith in themselves. Let me share that story with you. A farmer’s daughter’s duty was to carry fresh milk to customers in various villages. One of the customers was a priest. To reach his house, the milkmaid had to cross a stream by a sort of ferry raft, for a small fee. The priest refused to accept her explanation. He barked at her: “What! People have even walked across the ocean by repeating the name of God, and you can’t cross this small stream?” The milkmaid took his words very seriously. From then on she brought the priest’s order of milk punctually every morning. He became curious about it and asked her how it was that she was never late anymore. “I cross the river repeating the name of the Lord,” she replied, “just as you told me to do, without waiting for the ferry.” The priest was shocked. He didn’t believe her, and asked, “Can you show me this, how you cross the river on foot?” So they went together to the stream and the milkmaid began to walk on water. Looking back, the woman saw that the priest had started to follow her and was floundering in the water. I relate totally to that perspective. Most of the time, most of us are like that priest – holding up our clothes from getting wet, while professing faith in all the religions around us and in an external God. And that’s precisely the reason why we often feel depressed, deprived and lost in the face of Life’s challenges. When we learn to walk in Faith, in ourselves, than by sight alone, we will have learned to cross the river of Life – peacefully and joyfully! You can be happy despite your circumstances! You can be happy living with your problems! When we are in a problem situation, facing a challenge or solving something complicated or making sense of what has hit us and what’s going on, unhappiness is the first emotion that we experience. Because the very nature of a problem is that it is a problem ONLY because you don’t want it. Yet because you got it into your Life, without your wanting it, you plunge into unhappiness. When you are unhappy, dealing with anything becomes laborious, a drudgery! Then you stop living and merely exist. Everything becomes burdensome, every step you have to take is painful and you simply lose interest first, and sooner than later hope too. Has your being unhappy really solved the problem? Or helped it in any manner? Well, surely, it hasn’t! So, of what use is it to display__or carry within you__an emotion which is completely useless? The simplest, the most fundamental truth about Life is that happiness has NOTHING to do with the state in which you are. You can be happy in spite your circumstances. Your circumstances __ health, relationship, heart-break, break-up, loss__don’t make you unhappy. It’s your attitude that makes you unhappy. Let’s say a near one died suddenly. Now did the dead person make you unhappy or the act of the person dying make you unhappy or your attitude, your outlook, to (the) death make you unhappy? Obviously it’s your attitude. Anyone who has been born has to die. So, what’s so surprising about it? I am not being cold blooded here. I am not saying you should not feel for the departed soul and mourn or feel sad. Please do. By all means feel sad. But don’t cling on to the sadness so much that you stop living. And all you end up leading is a forever unhappy existence. Also when you realize that your expectation that this person should not die is the cause of your misery, your suffering and your unhappiness, you come alive, you begin to feel happy__and content__in the SAME situation. The person who died has not come alive. You have. This logic applies to every situation that causes you pain, grief and unhappiness in your Life. When you feel unhappy about something, examine not just the object that you think is causing your unhappiness, but also examine what attitude of yours are you bringing to the situation. When you do that you will notice that Life becomes that much more simpler to live. First, you start learning the art of being happy in spite of what’s going on with you. Second, your happiness will always help you deal with the situation much better. You too can learn the fine art of living happily__despite your circumstances, in spite of your problems. Begin by choosing not to postpone being happy waiting for your problems to recede or go away. Perhaps they may. But know that newer ones will crop up. Because problems thrive on Life. The dead don’t have problems. So, you can either be alive and happy__while you still have and deal with your problems__or you can be dead suffering from them. You decide. Author AVIS ViswanathanPosted on February 11, 2013 March 14, 2016 Categories Art of Living, Attitude, Challenges, Emperor of Maladies, Happiness, http://schemas.google.com/blogger/2008/kind#post, Intelligent Living, Jason Dehni, Lisa Ray, Multiple Myeloma, Swami Ramakrishna ParamahamsaLeave a comment on You can be happy despite your circumstances!